Citation Information: J Clin Invest. 2005;115(2):348-358. https://doi.org/10.1172/JCI22873. Although the primary determinant of cell tropism is the interaction of viral envelope or capsid proteins with cellular receptors, other viral elements can strongly modulate viral replication. While the HIV-1 promoter is polymorphic for a variety of transcription factor binding sites, the impact of these polymorphisms on viral replication in vivo is not known. To address this issue, we engineered isogenic SIVmac239 chimeras harboring the core promoter/enhancer from HIV-1 clades B, C, and E. Here it is shown that the clade C and E core promoters/enhancers bear a noncanonical activator protein–1 (AP-1) binding site, absent from the corresponding clade B region. Relative ex vivo replication of chimeras was strongly dependent on the tissue culture system used. Notably, in thymic histocultures, replication of the clade C chimera was favored by IL-7 enrichment, which suggests that the clade C polymorphism in the AP-1 and NF-κB binding sites is involved. Simultaneous infection of rhesus macaques with the 3 chimeras revealed a strong predominance of the clade C chimera during primary infection. Thereafter, the B chimera dominated in all tissues. These data show that the clade C promoter is particularly adapted to sustain viral replication in primary viremia and that clade-specific promoter polymorphisms constitute a major determinant for viral replication. Analysis of putative AP-1 binding sites in HIV-1 clade C and E promoters/enhancers. (A) Polymorphisms among transcription factor binding sites in the core promoter/enhancer regions of HIV-1 clades B, C, and E. The putative clade C and E noncanonical AP-1 binding sites have never before been analyzed experimentally. 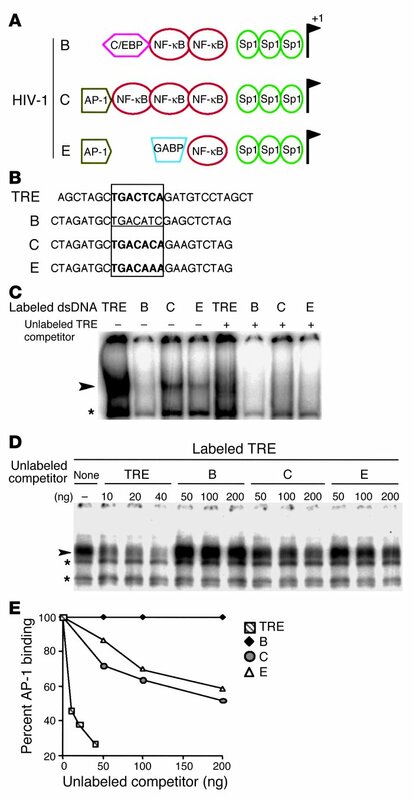 (B) 5′–3′ strands of the TRE, B, C, and E dsDNA used in gel-shift and competition analyses. The TRE of human collagenase 1, bearing a canonical AP-1 binding site (in bold), was used as positive control. C and E nucleotide sequences span the putative AP-1 binding sites (in bold) of the HIV-1 clade C and E enhancers, respectively. The clade B sequence spans the homologous sequence (underlined) in the enhancer region of the HIV-1 clade B LTR, used as negative control. TRE is flanked by AluI, and viral sequences, by XbaI (B, C, and E) restriction sites. (C) Gel-shift assays with HeLa nuclear extracts. Arrowhead and asterisk indicate AP-1–specific and nonspecific binding, respectively, to the indicated labeled dsDNA (0.5 ng), described in B. The presence of an 80-fold excess of unlabeled dsDNA TRE competitor (+) is indicated. (D and E) Gel-shift competition assays with HeLa nuclear extracts. Arrowhead and asterisks indicate AP-1–specific and nonspecific binding, respectively, to the labeled TRE (0.5 ng). Competition with increasing concentrations of the indicated unlabeled dsDNA competitors is shown on a gel (D) and was quantified by ImageQuant and plotted (E).